The ascent to the Mount Toubkal is challenging and requires you to be physically fit, but your efforts will be rewarded! After breakfast in your hotel in Marrakech, our driver will pick you up at 8am and take you to the High Atlas Mountains, where the trip starts from Imlil (1740m), the big Berber village situated 65 kilometers south of Marrakech. Here you will meet your team, who will accompany you during this amazing trek. The muleteers will deal with your luggage and within 30 minutes you start the walk with an experienced local mountain guide through the berber villages, following a mule track which will take you to the mountain hut via the shrine Sidi Chamharouch (2500m) where you will have your picnic lunch. After lunch we will have a short break, and then we continue towards the refuge of Mount Toubkal at 3200m. A hot shower is available and dinner will be prepared for you in the evening. You will spend the night in the refuge. Option: During the summer months, the night can be spent in a tent - to be advised in advance. The next day you have to get up very early and have breakfast and then start the ascent climb. We take step by step until we get to the point above the hut where you have a short break. 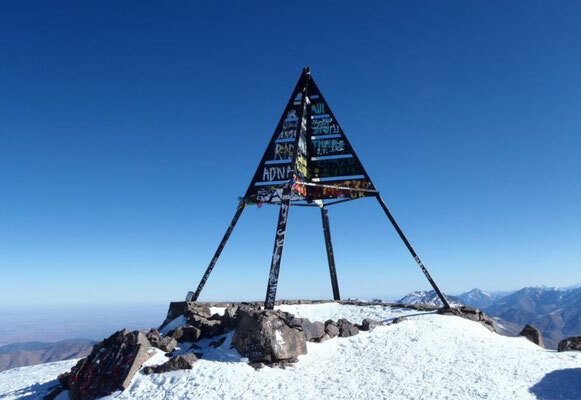 After 3 or 4 hours of walking up you will reach the summit at 4167m and have a breathtaking view to all the High Atlas Mountains. A break on the summit will allow you to take pictures and enjoy the view before we start going down to the refuge. Lunch will be ready for you then and after lunch we start our descent to Imlil by the same route. The driver will already be waiting to take you back to Marrakech. Option: You can spend one night in Aroumd. We will leave at about 9am from Imlil. Times are estimated and can vary according to season and to the group..